As a vacation aficionado, I didn't book this cabin hoping for the most luxurious weekend I've ever had. What I was mainly looking for was something cozy, comfortable, and relaxing. The Speckled Trout cabin in Cleveland/Helen meets those needs perfectly. The cabin is nestled comfortably in the woods just off of the beaten path. The ad boasts of a private waterfall in view of the hot tub which we didn't see. The hot tub did nurture our souls. It held it's temperature, the water was clean, and the jets all worked great. 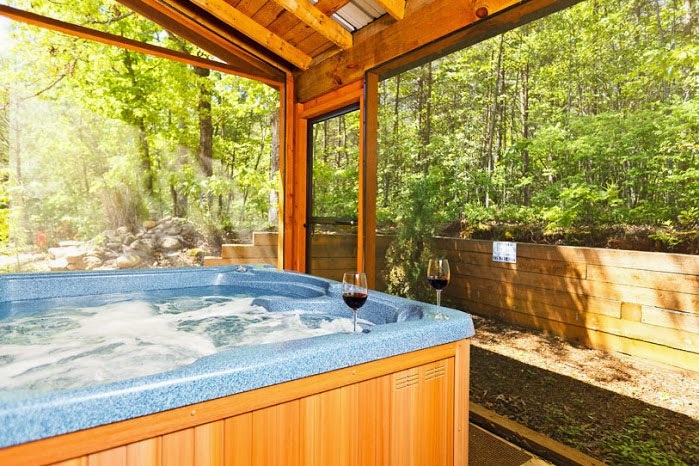 Our private getaway in the woods was equipped with satellite tv, wireless internet, and plenty of other amenities to make our stay more comfortable. However, there were plenty of draw backs as well. I guess it's the simple things that make a big difference to me. For example, there was a very large jetted garden tub that looked just fabulous. The problem here being that the hot water heater in the cabin was grossly undersized. There was no way to fill the large tub with hot water. The hot water would run out long before the tub had enough water to even reach the jet pump. I tried to fill it with water and then was going to top it off with hot water, in hopes that we could take a relaxing bath. That method didn't result in warm enough water either. I turned on the jets just to see the tub work (since I couldn't actually use it), and the pump/jets didnt seem to work very well. They spit and sputtered and then dumped some black particles into the water. No matter, we just went back out to the hot tub to relax. After our dip in the hot tub, we decided to try out the "large walk in shower for two". The shower was very large and had a nice design. But, again the water heater failed us. We didnt even have time to shower thoroughly before the water was as cold as ice. The cabin appeared to have a surround sound system with speakers mounted on the walls, but sadly the speakers weren't connected to anything. Odd, but not a big deal. The bed made a standard door seem comfortable. With cheap, hard mattresses and terrible pillows, I had a hard time going to sleep. When I woke up in the morning, I had a stiff neck and headache that I kept for a good bit of the day. All in all the experience was pretty good. The cabin served our purpose very well. Our favorite part was the hot tub. It was wonderful to be able to spend some quality time together in this private cabin. Though it rained for most of our stay, that just added to the comfortable cozy feeling of the cabin.